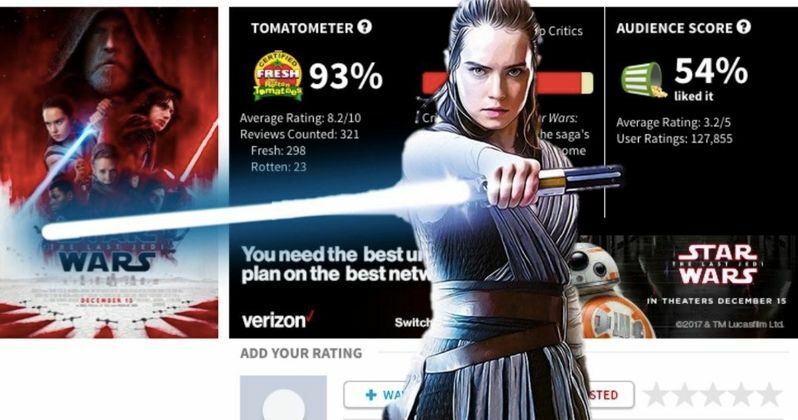 Much has been made of the Rotten Tomatoes score for The Last Jedi in the days since the movie was released. Critics generally seem to like the movie, if not love it, but the audience score tells a different, and allegedly more complex, story. Currently, the movie holds a 54 percent audience rating on Rotten Tomatoes, worse than that of Star Wars: The Phantom Menace, believe it or not, against a 93 percent approval rating from critics. Despite some controversy, Rotten Tomatoes asserts that this score is legitimate. Dana Benson, spokesperson for Rotten Tomatoes, had this to say. "We have several teams of security, network, and social database experts who constantly monitor reviews and ratings to ensure that they are genuine. They haven't seen anything unusual with The Last Jedi, except that there has been an uptick in the number of written user reviews submitted. Aside from that, everything is normal and we don't see any unusual activity. We looked at The Last Jedi compared to other blockbusters and it has been consistent with those past films." The low audience score for Star Wars: The Last Jedi, which has been crushing at the box office despite this score, came as a shock to many. Reports have suggested that this low score was the result of an effort by internet trolls, creating fake accounts in order to give the movie a low rating. If that's the case, then Rotten Tomatoes doesn't classify that as "unusual." The plot has certainly thickened with these new comments. Dana Benson also notes that reviews for the latest Star Wars movie are "comparable to the number of reviews for The Force Awakens." So even though the number of reviews is comparable, many more of them are negative for The Last Jedi. Benson also pointed out that other sites feature negative reviews as well. But, those could also be, in part, attributed to trolling. However, Benson assures that Rotten Tomatoes is doing their part to make sure the scores on their site are authentic. "We've been working around the clock to get the numbers right. Authenticity is very important to us. We have security teams, network teams, database teams who work so hard, it's a little disheartening for them to see people make such [accusatory] claims without knowing the facts." Many in the industry have been vocal about their distaste for Rotten Tomatoes, and a situation like this makes it clear where that distaste comes from. Star Wars is the biggest franchise on the planet, so these negative audience reviews are very important in either case. If they're authentic, as Rotten Tomatoes asserts in this interview with Forbes, that may be cause for concern for Lucasfilm and Disney. If they're the result of internet trolling, that's a much bigger concern that goes far beyond a single movie.